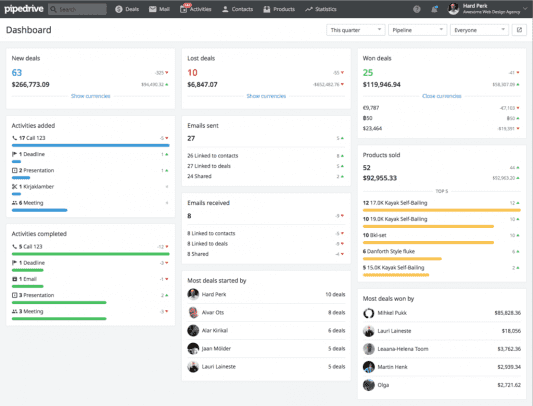 The key to a successful dashboard is being able to organize it in a way that best fits your business’ needs. It’s not enough to purchase a sales CRM software. Agents typically have a hard time adopting the software because they don’t know how to use it in a way that works with their strengths. In order for sales agents to ensure they don’t just use their sales CRM software as a place to store their contact data, sales automation providers are trying to make the user experience more personalized by offering agents and managers customizable dashboards. We’re going to break down what features need to be utilized by sales managers and sales agents, why they’re so important, what metrics agents and managers should keep track of, and what providers offer the best solutions for your business. Many agents stop using sales CRM software because of how good it is at collecting data. It typically collects so much data that it often overwhelms agents to the point where they can’t do anything with it. However, sales automation providers can help agents by making dashboards customizable, only showing the data they ask for. 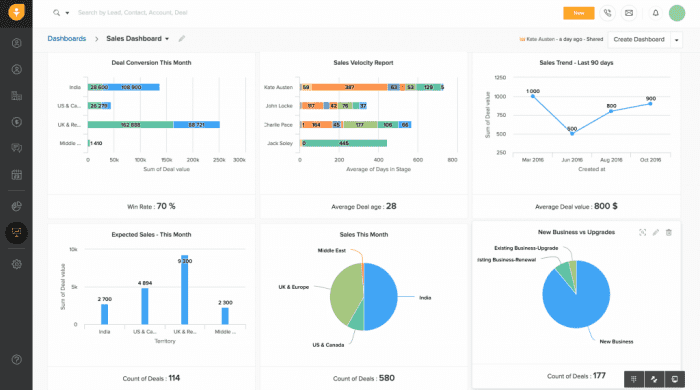 Sales CRM dashboards matter because proper organization is the foundation for sales, marketing, support, and management teams in any business. The dashboard is where sales agents will be directed to when first opening their CRM software, so whatever information that matters most to them needs to be front and center. Pipedrive, for example, offers users tons of categories and metrics to arrange on the dashboard. Managers can use metrics similar to these to get an overall picture of which agents are currently doing the best work and how many deals have been won/lost. Agents can focus on metrics like “Emails Sent/Received” and “Activities Completed” to keep track of their day-to-day activities. 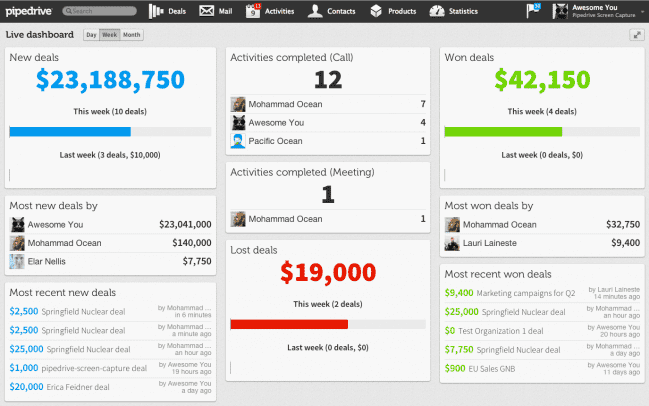 Sales CRM dashboards tend to be accessible by all the sales agents, whether they’re working in the office or remotely. Agents can use sales CRM dashboards, regardless of location and how they’re accessing the dashboard, to look at KPIs that matter most to the team, and even to spark friendly competition with each other by seeing each agent’s numbers for the day/week/month. Let’s look closer at what features sales agents and managers should look for. Sales agents are constantly in and out of the office, which doesn’t mean they shouldn’t be able to benefit from all the features sales CRM software has to offer. 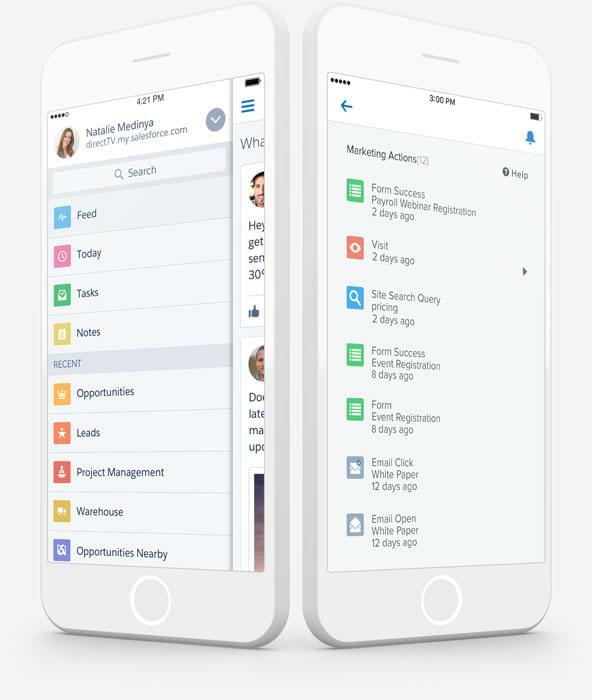 Being able to pull up tasks, reports, calendars, and contact data on the go can make all the difference in an important meeting. There’s an extra, unnecessary step now for the lead. He/she has to now go online, check their email, and then make a decision. All of that takes time, and all that time is just giving the lead a chance to back out. If there’s a good flow in the meeting, don’t let a simple report be the difference maker. Sales managers and sales agents typically have different tasks throughout the day. One isn’t necessarily more busy than the other, but their priorities are different, and the numbers they need aren’t going to always match up. Luckily, most sales automation providers offer users multiple, customizable dashboards, so managers can look at one dashboard while agents look at another. 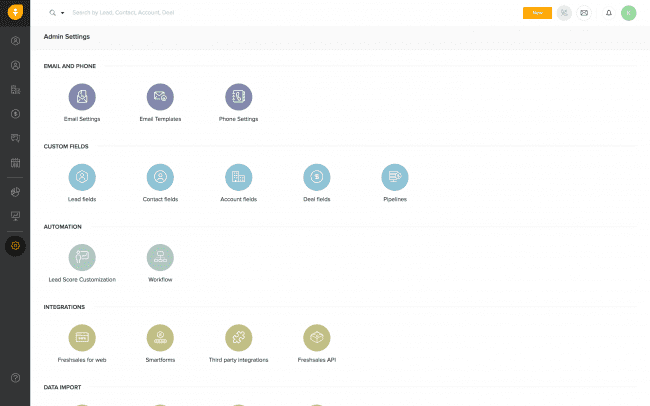 We’re going to start with what sales managers should look for in a sales CRM dashboard. The sales pipeline is a visual representation of the buyer’s journey that managers should be taking advantage of. The goal for each lead and opportunity is to get through the pipeline quickly, so managers need to keep track of what stage in the pipeline leads and opportunities are, how fast they’re getting through, and what can speed things up. It’s also important for managers to see how many closed sales the team has. Sales teams strive on reaching out to tons of leads in order to weed out the iffy ones until they’re left with only quality leads. If there are not enough sales being closed, that indicates agents need to do a better job at the end of the journey, or leads aren’t up to par and marketing efforts need to change. Sales managers have to keep this in mind. 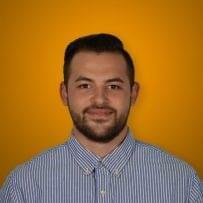 Sales managers should also want weekly and monthly reports on other KPIs aside from closed sales. We’ll get to those KPIs a little later, but for now, it’s good for managers to have a sense of which ones matter most for their sales agents, to use them to judge how effective their team is, and to determine which agents need help or are going above and beyond. As we mentioned before, the goal for each lead and customer is to go through the sales cycle as quickly as possible. Pipelines are a good way for managers to visualize the process, but pipelines can have too many steps or unclear steps that can create bottlenecks. Managers should get specific reports on the sales cycle/velocity to ensure things outside their agents’ control aren’t causing issues. Managers should also keep track of how their leads, opportunities, and agents are interacting with one another. Leads and opportunities are looking for personalized experiences. Managers need to know their preferred methods of communication in order to improve the customer experience and increase the likelihood of closing sales. Sales forecasts are created based on all the sales data that’s gathered by sales CRM software. These forecasts, now with the help of AI, can determine based on teams, individual agents, and territories how a business will do in the future. These forecasts are important because if multiple agents, teams, or territories aren’t working effectively, it can decrease the amount of revenue generated. 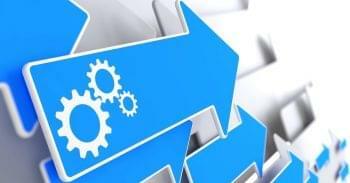 Forecasts give managers time to make significant adjustments to ensure business runs smoothly. Keeping track of certain activities and events is key for managers who want their teams to play a more active role with their leads, customers, and even communities. If there’s an important meeting or video conference to attend that can lead to a significant revenue increase, you better not miss it. If there’s a small business fair in town and you want to set up a booth, the calendar will be front and center so no one forgets. Important leads, opportunities, and customers should have their data front and center — especially those who need regular nurturing. It’s easy for contact data to get lost with everything else in a sales CRM software, so managers need to make sure that the leads and opportunities that matter most to the business can be easily accessed. Agents are typically the ones working one-on-one with leads and opportunities, so it’s important for their sales dashboards to reflect important details that help their day-to-day activities run more smoothly. Let’s look at what should be included on a sales CRM dashboard for agents now. Sales agents should have a clear picture of leads and opportunities ready to initiate contact with and to begin the sales process. The goal is to have lots of leads in the beginning of the pipeline or funnel; then as the process continues, lower quality leads are weeded out and agents are left with qualified leads that have a higher potential to convert into sales. Keeping a tab on open leads helps agents stay focused at each step. People are different and have different ways of doing business. Agents need to keep this in mind by segmenting their leads and opportunities into categories based on specific demographics in order to personalize the experience. Keeping customer segments on the sales CRM dashboard will help agents to remember how to approach each experience. This is very important when trying to make a good first impression. Agents should also have the sales pipeline on their dashboard because customers will always be at different stages of the buyer’s journey. Each stage requires different kinds of communication. An agent doesn’t want to talk to a lead who’s ready to make a purchase as if they’re contacting the business for the first time. That’s weird. Having a pipeline on the dashboard will continue to help agents stay organized. 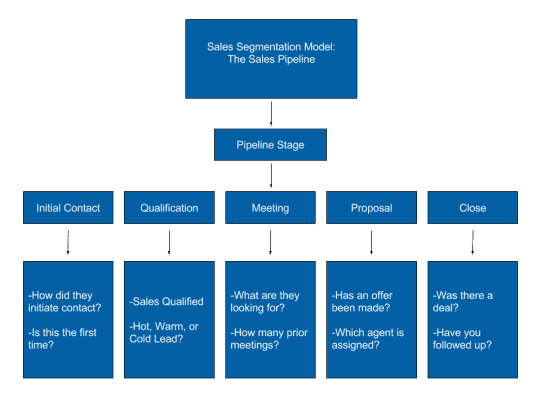 Sales workflows can be defined as all the steps an agent takes to reach out to a customer and initiate the sales process. A workflow could be going into the office, checking and replying to emails, meeting with the manager, get updates from the other agents, and then calling leads. Some CRM software like Freshsales can include all of this on the dashboard so agents stay on top of all their tasks throughout the day. This is also important for sales agents because agents are typically out of the office due to meetings with leads and opportunities. It’s important to stay on top of all the events and activities throughout the day and week so proper preparations can be made. Agents are also constantly contacting leads, opportunities, and previous customers so it’s important for them to keep all their clients on the dashboard for easy access. This data should be accessed when agents are making phone calls so they have all the prior context they need to personalize the experience. Many sales CRM software providers are offering VoIP integrations, meaning users can call people over the internet instead of using traditional calling methods. 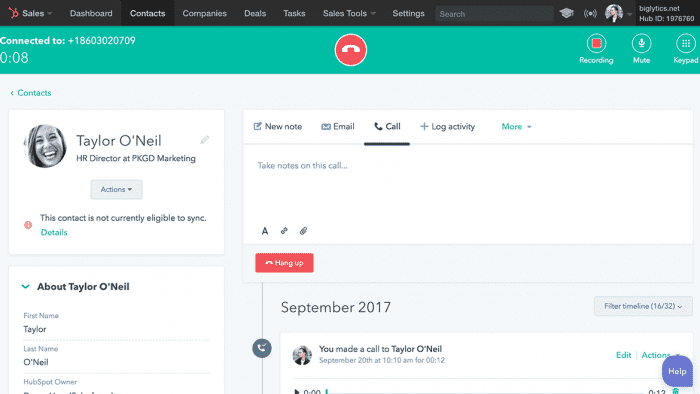 HubSpot users, for example, can call people directly from their dashboard. This is useful because a user can have a lead’s contact info and make a call all on the same platform. Offering a more seamless user experience naturally boosts the overall experience for the lead as well. Teams are most effective when everyone is on the same page, working with the same data, and receiving updates in real-time. Seeing all this data directly on the dashboard is a great way for individual agents to see what everyone is up to, what kind of data is being gathered, and how to use it to their advantage. If someone sees a mistake on a contact form, they can simply change it and let everyone know directly in the CRM. Sales CRM dashboards can be fully customizable and providers usually offer users the ability to create more than one at a time. 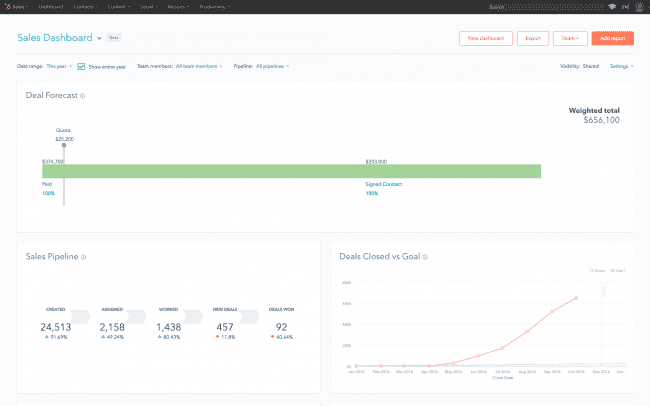 This means businesses can have a dashboard for managers, another for agents, and one even for KPIs. Here, we’ll break down which KPIs are worth keeping track of where agents and managers can benefit. A good sign of success for sales teams is the rate at which customers are not just buying the product they originally set out to get, but the rate at which they’re buying another product of equal or even higher value. This shows customers are confident in the product to spend even more, which is a sign the sales team is going above and beyond. Sales by contact method is another great metric to include on a sales CRM dashboard — especially for businesses who offer leads, opportunities, and customers an omnichannel experience. That essentially means customers are offered various ways to reach out to a business and vice versa. Keeping track of how agents interact with leads can ultimately determine what works and what doesn’t overall. Prospecting activity is another great metric to consider putting on a dashboard because the methods at which sales teams use to find potential customers will be hit or miss. It’s important for each agent to know what methods of reaching out are working best. Close sales, as we’ve already mentioned, are simply the number of sales that have gone through the entire sales process. Seeing the number of how many closed sales there were at the end of the day, week, or month will be a good indicator of how well each agent is doing. That number can also be compared to other days, weeks, and months for agents and managers. New leads and opportunities should definitely be measured because the more leads a business brings in, the better the odds of increasing the number of quality opportunities and customers becomes. Agents and managers want to make sure that this number remains a high, but manageable, number. This is a combination of the two previous sales KPIs. The ratio between leads and sales should be very small. If it takes an abnormally large number of leads to find one opportunity or quality customer, that suggests to managers they should either look elsewhere for leads or talk to their agents to see if there’s an issue closing sales. This is good for both agents and managers. Agents can use these numbers as a way to spark friendly competition between each other. Having this number right on the dashboard is also good for managers who want to see which agents are doing well, which ones are going above and beyond, and which ones need some help. This is an often overlooked metric by businesses that we think should get more attention. It’s good for businesses to have a high number of leads, but not if it costs more to acquire then than what makes good business sense. If those leads turn into customers that don’t warrant the high cost, consider shifting your priorities. Having a high number of customers is great, but it doesn’t mean much if there’s no solid foundation of repeat customers. These people who come back time and time again will spread the word about your business. It’s important the customer retention rate is high while churn rates remain low. This is a great metric to keep on a dashboard so important clients don’t get forgotten about and even the small ones have a chance. This is an important long-term metric for sales agents and managers because when you’re in the moment of day-to-day activities, things can seem like they’re going well when the opposite could be true, or things can seem like they’re going bad, but it’s the best month all year. What’s important is that everyone is aware of the monthly sales growth small things don’t turn into larger ones. 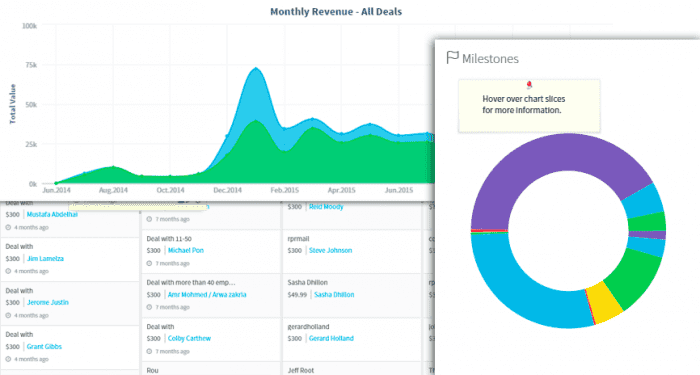 Sales CRM dashboards are a great tool for sales teams — both managers and agents. Sales automation software is a fantastic way for businesses to take all the contact data they acquire and organize it into a way that makes the most sense for them. 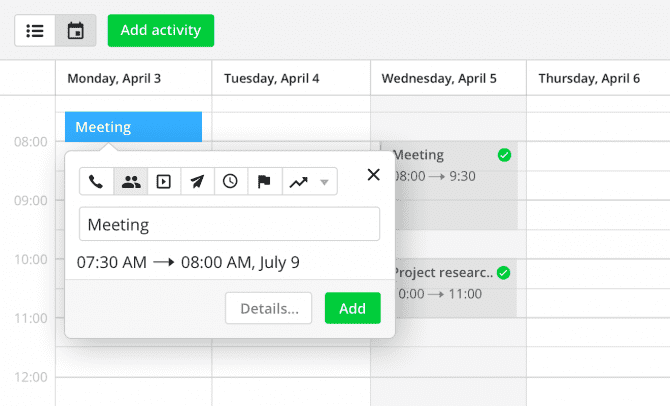 Sales teams, as we’ve discussed, use it primarily for organizing contacts, generating daily/weekly/monthly reports, and for generating sales forecasts. 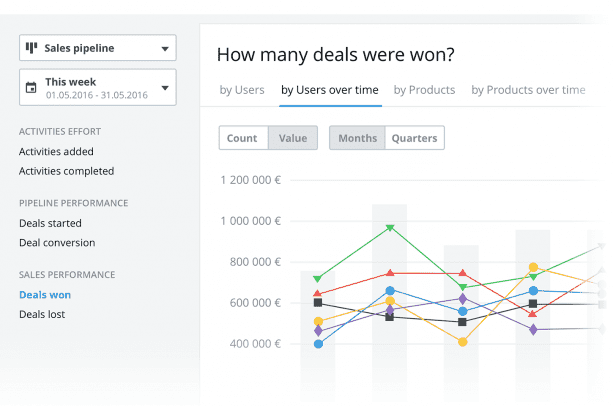 The dashboard is the hub of the sales automation software. Without it, or without properly organizing one, all the data a company receives will remain completely unorganized. Agents have a hard time adopting sales CRM software because they don’t realize that they can’t rely 100 percent on the automation features. Thankfully, sales automation providers offer businesses customizable dashboards where they can add metrics, see quick reports, share them with the team, pull up contact data forms, and even call contacts directly from the software with VoIP integrations. Businesses can even create multiple dashboards to further organize the data. 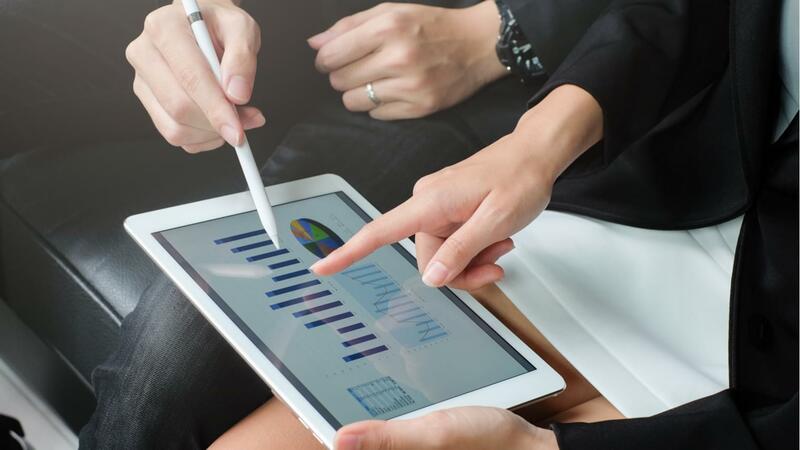 Ultimately, if businesses aren’t taking advantage of the organizational features that come with Sales CRM dashboards, they’re shooting themselves in the foot. When agents and managers take the time to improve their own user experience, they’ll offer leads a better experience and increase the odds of converting them into a customer.